It has been pretty hot as of late so a dawn patrol ride was in order. Lake Hodges was the place. My sweetie joined me on this ride as well. We pretty must did the north side trails as an out and back. It is definitely summer with pretty much all the vegetation in dry hot weather mode. There was some surprises. The cacti for example has just recently flowered which I expected that would have happened much earlier in the year. Sunday I did an MTB ride-along with San Dieguito River Park Senior Ranger Dave Hekel. After my recent Coast-to-Crest Trail trip I had some questions about the park and tagging along on his Sunday patrol was an easy what to chit-chat about the park and get in a ride. I ride Lake Hodges quite often as of late. It is right on the way home so it is in the routine post-work ride rotation. I have seen lots of critters out here on these trails. Deer, snakes, coyotes, rabbits and all kinds of birds. On this ride I ended up with a critter encounter of completely different sort. While riding the “high road” single track on the north side we came across an obviously distressed little coyote pup stumbling across the trail like a drunken sailor. After a quick look around the hillside to see if mom was anywhere nearby, I scooped this critter up. It was tiny and whopped and did not resist in the slightest to me picking it up. A quick scan showed that this female pup was not injured but had pretty big tick in one ear. Dave went up the canyon to see if there was an unattended den but could not find anything. We guessed that this little gal had been away from momma for a least a full day or two. While Ranger Dave was getting all of the arrangements made quite a few riders came by so the this pup because the star of trailside show and tell session. Soon the rangers had a plan. I rode/walked the rest of upper singletrack with this pup nuzzled up between one hand and my chest to a meet up spot with another ranger with a truck. While Dave and I waited for the other ranger to arrive the pup feel asleep in my hands. There was a point when we wondered if she had “checked out” but then I could feel her chest going in and out so things were good. Once the other rangers arrived we handed off the pup to them and they were off to a nearby wildlife recovery facility. After that we went off to finish out the rest of the patrol. We did encounter a rattlesnake on the trail and I did a slight bump stop into the back of Dave. Normally seeing a rattlesnake is kind of a big deal but considering that this was the 14th rattler I have seen this year (I typically only see 2-4 a year) along with the coyote pup just a little while ago, this rattler sighting was kind of ho hum. It was a beautiful day but after the coyote pup and the rattler then return trip back the ranger office was uneventful. This was a most excellent day to be out on a bike and reinforced to me that your next life enriching event could be right around the next bend in the trail. 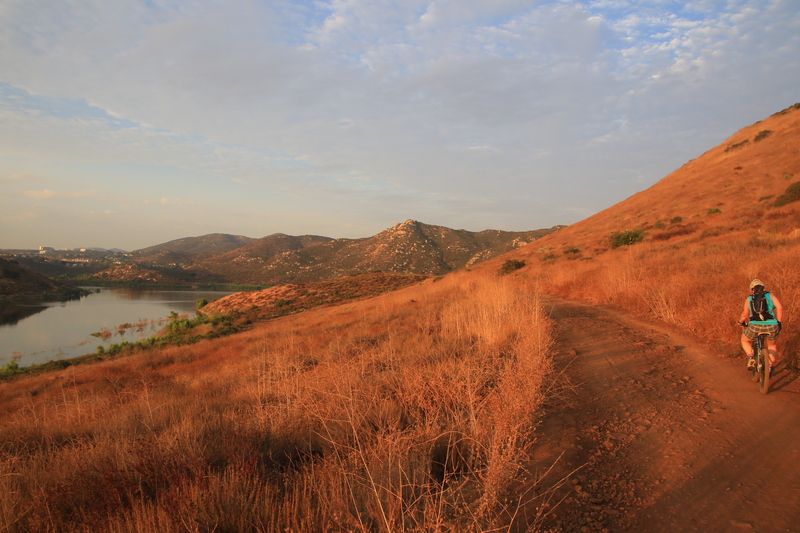 I added the Mule Hill and San Pasqual Valley trails located near Escondido to the site. You may also hear these trails referred to as Raptor Ridge as that is the top of the climb. While this is for the most part a non-technical trail, the farmland scenery not typically associated with San Diego it offers is worth a look-see. I did my first bike packing trip this weekend. A group of six of us set off to do the Coast to Crest trail leaving from Julian with the plan to end with our tires in the ocean on Del Mar’s Dog Beach. The Coast to Crest trail is a long way from completed and our route is basically follows the general corridor of where the trail should someday follow as best as we could follow it. We pedaled out on Main Street/Farmers Rd for about 2.5 miles out to the start of the trail at Volcan Mountain Wilderness Preserve. Full disclaimer here, we did not climb all the way up to the top of the mountain as it is a steep out and back on double-track. The top Volcan Mountain is the “Crest” of the trail. From the Volcan Mountain Preseve we zipped down the paved Famers Road to the Santa Ysabel Open Space Preserve East. It has been quite some time since I had ridden out here. I had nearly forgotten just how pretty it is out here. The first climb was rather steep and all of the bikepacking gear quickly found myself out of clicks on my shifters. The crew taking a break (Left to Right: Kevin, Carl, Greg, Chad and Ken) at our highest point along the trip. We did quite a bit of descent and a few short bit of steep climbing before we came out at the lower staging area of the preserve. There is a massive section of trail that is not built from here. Our path from here was a quite bit on Highway 79 north and then a good long chunk of pavement climbing on Mesa Grande Road. When we did reach of the bottom of the road, we turned onto the San Ysabel Truck Trail which is familiar dirt to me as it is part of the Black Mountain (Ramona) Loop near Ramona. This is part of the official Coast To Crest trail. There was some work to be done here as we worked over the south slope of Black Mountain before we had a very zippy descent down into Pamo Valley. We then pedaled south on Pamo Valley Road (mostly dirt road) before hooking up with Forest Service Road FS12504. We chased down a spot to setup camp for the evening. We did a touch under 35 miles for day one. Tasty sprits seems to find there way into most of our packs. Since every ounce counts we felt it wise to lighten our load for tomorrow as much as possible 🙂 All of my gear worked pretty much as expected and there were certainly some lessons learned. I slept really well that night and awoke to the sounds of turkeys gobbling in the distance. Not long after that a lone gunshot rang out that reminded me it is turkey season. I did not hear any more turkeys after that. I had under estimated my fuel requirements for my alcohol stove but I did have just enough to get a couple cups of coffee made to go with breakfast. Coffee just tastes better outside. We leisurely broke camp and were back on the trail. Forest Service Rd 12504 is referred to as the Lower San Ysabel Truck Trail by the San Dieguito River Park. After just a bit of climbing, we were treated to a very mild grade descent. Carl and Kevin are pictured above heading down a particularly nice covered stretch of the truck trail. Kevin was doing this ride on his rigid single speed and was just killing it. He also had a killer ultra-light setup. The Lower Santa Ysabel truck trail took us down to the Orasco/Gueito Truck Trail. This truck trail is not part of the official Coast to Crest trail at his point. We did take this truck trail up to Highway 78. We had to cruise down the highway for a couple of quick downhill miles where we hooked with some farm roads along the orange groves. These farm roads took to the Bandy Canyon trailhead of the San Pasqual Valley trail that is part of the Coast to Crest trail. The trail goes along the edge of orange groves, sod and dairy farms in the valley before it starts climbing. Climbing up to Raptor Ridge was a good bit of work with the gear on the bike. After that we were back into the routine home turf of Lake Hodges and we made quick work to the Farmers Market and the gas stations near the I-15 trailhead for some resupply. Nichol joined us through the Lake Hodges segment. (I think see liked this ride as the pace was slower than our normal outing speed). There was some climbing bits to be done including a sizable set of switch backs. Once we got to the top of the switchbacks we were once again off of the official Coast To Crest trail. We ended up dropping into the Lusardi Creek area via some singletrack and then working our way up to where the Santa Luz Loop starts. From here we had to do a five mile stretch of pavement along San Dieguito Road and El Camino Real to connect to the next segment of the Coast to Crest trail. We were able to squeeze out another 1.1 miles to Pizza Port Solana Beach for some yummy pizza and tasty beers! A mighty fine weekend to be on a bike. I have been hitting up Lake Hodges as the after-work ride as of late. It is right on the way home at it only take a handful minutes to be out on the trail after getting off the freeway. Here is Nichol working a log ride. Critters seen along the trail. Views from the trail behind and above the boat launch. A mechanical on the Tuesday ride turned me into a reluctant single speeder. Of course it happened right after the apex of the ride. So I have not dusted my night-time riding gear in quite sometime. As an after-work ride in January chasing the sun is always part of the equation. The sunsets have been pretty awesome as of late so “losing” the race with the sun is its own reward. On Sunday Jake had hockey practice over at Kit Carson park in Escondido so I took the opportunity to get in some pedal time out at Lake Hodges. I stuck to the North Side trails on this outing. 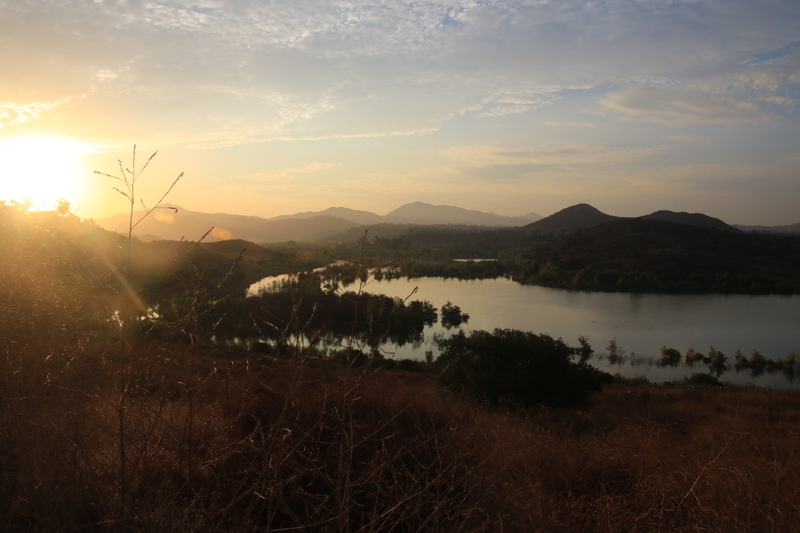 Updating the Lake Hodges pages on my website has been on my to-do list for quite some. Now that there is a pedistrian and bike bridge connecting the north and south side of the lake there are more ride options in the area on a single outing. Additionally, a few years ago I got a letter from some of the land owners and the western end of the easement road (known as the high road) that did not want anyone using the easement rsload for recreation and asked that I take down that information from my site. Well obviously I’m a busy guy and have not be able to get to that yet. It looks like it maybe all figured out by now since new signage has gone up. Of course that new signage has made things as clear as mud. Take a look at the picture above. The easement road sign says “No Trespassing” yet they installed a people tunstill beside the gate. New signs were put up telling you it is okay to hike and bike to the right, but no trespassing to the left. Looking at the sign above at the far western end of the easement road one would think it is okay to go through the gate and ride off to the right vice on the easement road that goes to the left. That is not the case at all. What the signs are trying to convey is that when you are on the easement road, everything uphill of the road is private property and everything downhill (towards the lake) is part of the park. This is also not entirely correct as the private property owners land typically goes some number of feet/yards downhill of the road. The park has put up private property signs at the bottom of the trails that connect the lower trails to the upper easement road. I find it odd that some of the land owners don’t want people on the eastern end of the easement road, yet nearly all of them have gates onto the easement road from their backyard. Presumably so they can use the easement road to get into the park. Hmmm so it is okay for those land owners to get onto the little sliver of the easement road they own and then trespass on their various neighbors property and then enter the park through unauthorized trails but it is not okay for the public to do so. Hmmmm, the best advice I can give is to do your best to make sense of the various “non-truth” signs you see and make your own judgement calls. Following the predominate and fresh foot and bike tracks is probably a safe bet. The Benardo Mountain trail has no controversy involved with it. It just a nice trail that will work you over on the climb up to the peak. There are some tough grade sections and some technical bits as well that will test both skill and fitness. There was some nice purple blooms going off on the climb. The view of the bridge connecting the North side to the South side from the peak. Snow on the mountains to the east. After Bernardo Mountain I rode out towards the dam until it was time to turn around and get back to the rink. I made it back just as Jake was get off the rink so two sweaty Porter Boys to funk of the truck on the drive back to Casa Del Bill. This is the second year a group of advocates and friends got together to do a ride that has become known as the Archipelago Ride. Open Space in coastal San Diego County has become very fragmented over the years into a patchwork of “islands of open space”. The Archipelago Ride concept is one to demonstrate how these islands can be linked together into a rides of epic length. This years ride started at the La Costa Preserve and went to Probuilt Wheels on the western end of Penasquitos Canyon. Getting there was by way of Elfin Forest, Lake Hodges, San Deiguito River Park, Lusardi Creek, Santa Luz, and Black Mountain. The day started off early in the moaning with most folks grabbing a shuttle from Pro-Built up to La Costa. Once we got up to the La Costa the gaggle of riders was even larger. I think the total rider count was 37. I thought for sure with this many people that the regroup logistics would make for slow going. Slow going would not be a bad thing for me today. Jake had an ice hockey game going on that morning so the plan was to help get the ride started and then catch the game and grab onto the ride around Lake Hodges. I decided to grab some shots of the group from Harmony Grove Road as they went of the Escondido Sewer Easement and I was quite surprised at the pace the group was making as they got there quite earlier than I had expected. Roughly about this same timeframe, I got a call for Jake’s coach that the game was later than what was orginally published, so there was little chance that I was going to catch all of Jake’s game. I did however manage to get the ice rink for a bit before I got the call from the ride sweep letting me know the group was rolling into Hodges. I booked it from the rink and got setup below the Hodge Dam. To lead the group for a bit on a different route from last year. The general consenus was that everything was going along smoothly…and then I took over 🙂 So this “new” route had a little “technical hike-a-biking” in it. The climb-a-biking was a neccessary evil to get to a creekside trail that was pretty sweet with a bit of technical flow to it. This was a recent find for me so I was stoked to show it off. After the creek side riding we followed Lasardi Creek for a short ways and then we took a different route from last year up to the Santa Luz Loop. I like the congo line of helmets through the flowers above. Once up to the Santa Luz Loop things went pretty quickly to Black Mountain Park and the waiting sag wagon. In addition to snacks there was mighty tasty fluids suitable for rehydration. After Black Mountain Park we continued on the Santa Luz Loop and then took the connector over to McGonigle and Deer Canyons. Our last major regroup was just before entering Deer Canyon. SDMBA had tried to get the permission to use one of the tunnels for this ride, but with all of the controversy with the area we were relegated to “Tunnel Zero” aka the God forsaken powerline climb up onto the mesa. Once up on the mesa, everyone knew the way “home” so the proverbal hounds were released and everyone seem to move quicker. There were tasty grub and brews awaiting back a Probuilt Wheels. It was a great way to end this 42 mile ride that had 5,000 plus feet of climbing. I was amazed at how close this group was in relative strength and endurance. The group was never really strung out and the group make good time over the course of the day. Here is a photo album with all of the pictures I took during the ride.